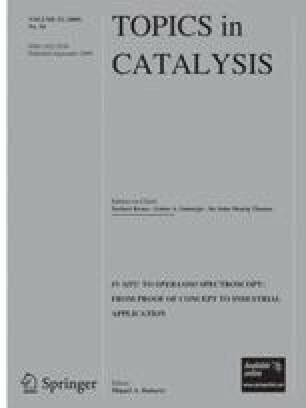 Co-containing NO x storage and reduction catalysts were investigated to identify the mechanism of Co promotion. X-ray diffraction and temperature programmed reduction demonstrated that Co exists in a highly oxidized state (Co3O4) and that the surface oxygen could be removed from the catalyst a typical operating conditions around 300 °C. Electron microscopy showed that Co is more uniformly distributed over the catalyst surface, as compared to Pt, with particle sizes ranging between 20 and 80 nm. In situ IR studies illustrated that NO x storage occurs on Co-containing NSR catalyst via formation of nitrites and nitrates as surface intermediates. Finally, it was found that, similar to Pt, the addition of Co to Ba catalysts enhances the nitrite to nitrate transition rate and also increases the overall formation of nitrates. Therefore, the promotional effect shown by Co is the result of the combination of increased NO to NO2 oxidation and improved surface area for NO2 spillover to the Ba storage sites.